Starring Michael J. Fox, Christopher Lloyd, Crispin Glover, Lea Thompson, Thomas F. Wilson, Claudia Wells, James Tolkan, Casey Siemaszko, Billy Zane, J.J. Cohen Marc McClure, Wendie Jo Sperber, George DiCenzo, Jason Hervey and Huey Lewis. Screenplay by Robert Zemeckis & Bob Gale. Distributed by Universal Pictures. 116 minutes. Rated PG. Starring Michael J. Fox, Christopher Lloyd, Thomas F. Wilson, Lea Thompson, Elisabeth Shue, James Tolkan, Casey Siemaszko, Billy Zane, J.J. Cohen Marc McClure, Wendie Jo Sperber, Jeffrey Weissman, Elijah Wood, Jason Scott Lee, Joe Flaherty and Flea. Distributed by Universal Pictures. 108 minutes. Rated PG. Starring Michael J. 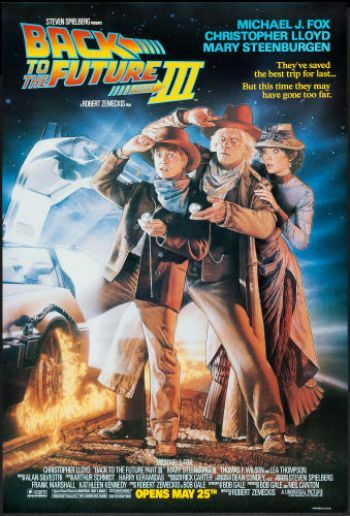 Fox, Christopher Lloyd, Mary Steenburgen, Thomas F. Wilson, Lea Thompson, Elisabeth Shue, James Tolkan, Matt Clark, Dub Taylor, Harry Carey Jr., Pat Buttram, Marc McClure, Wendie Jo Sperber, Jeffrey Weissman, Flea, Burton Gilliam, Richard Dysart and ZZ Top. Distributed by Universal Pictures. 118 minutes. Rated PG. Back to the days of LA Gear, Pepsi Free, Max Headroom, down vests and souped-up DeLoreans. Back to the days when Michael J. Fox was just a sitcom star getting his first shot at big screen stardom. Back to the days when it still seemed kind of novel to see Crispin Glover cast as an oddball. Back to the days when Robert Zemeckis was an upcoming wunderkind writer/director who still used actual human beings in front of the camera, before he discovered motion capture animation and rode that style to three straight bad literary adaptations – The Polar Express, Beowulf and The Christmas Carol. We’re going Back to the Future. The original classic trilogy is being re-released (yet again) on video in a special 25th Anniversary package. This means – hard as it is to believe – that in just five years, the 1985 present day of the Back to the Future films will be as far in the past to the audience as the 1955 “Enchantment Under the Sea” dance in which Marty McFly was able to manipulate his parents into having their first kiss was to the characters. It also means that, again, in just five years, we will have hit the future world that was explored in Back to the Future, Part II – though sadly there are still no signs of the hover cars promised in the storyline. First things first. The original film is still amazing. The second film is pretty lame. The third is a little better than the second. But let’s face it, 99% of the people really only have any interest in seeing the first film over again. This is the reason that they are being packaged together – because there is no way in hell that anyone would buy Back to the Future, Part II and Back to the Future, Part IIIas individual titles. However, anyone could and should buy Back to the Future. The original is everything that a classic film should be – funny, exciting, thought-provoking and at the same time simply fun. Back to the Future tells the story of Marty McFly (Michael J. Fox, who had just become a TV star in the past couple of years on the sitcom Family Ties). If you ever doubt the character’s iconic status, there is a long-running band named McFly after him. Marty is a typical 80s teenager – he wants to be a rock star, loves his hot girlfriend Jen, hates school, is mortified by his family and wonders if he is just like them. One night Doc Brown drops a bombshell on Marty – that he had created a time machine out of a late model DeLorean. When their first test is interrupted by terrorists, Marty mistakenly goes back in time thirty years. While there he runs across his parents as teens and realizes they are nothing like he thought they might be. Unfortunately, by interacting with them, he has apparently changed history, so he must make sure his parents fall in love while he attempts to get back to his own time. 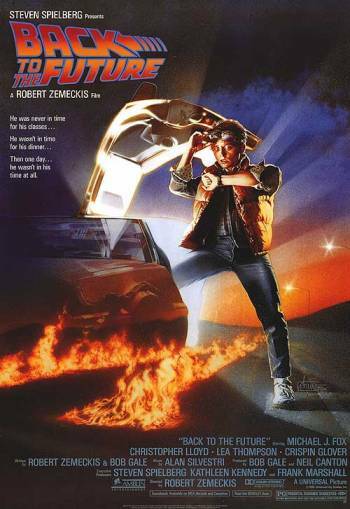 Back to the Future was such a huge hit that a few years later, the saga became the first film to have two sequels filmed concurrently – one to be released in winter 1989 and one to be released in summer 1990. These two concurrent sequels have been done periodically over the years since the Back to the Future example, but again only on blockbuster franchises like Pirates of the Caribbean, The Lord of the Rings and Harry Potter. The beginning of Back to the Future, Part II starts off exactly where the end of Part I let off. Literally, it recreates the last few scenes of the first film. And yet, right off the bat, we can tell there is something off. This is because those final (first) scenes have been re-filmed with actress Elisabeth Shue replacing actress Claudia Wells in the role of Marty’s girlfriend Jennifer. This is no one’s fault – apparently Wells had to forego the part because her mother had been very ill with cancer, which is certainly a very understandable reason. And Shue – who at the time was hot off The Karate Kid and Adventures in Babysitting and to this day has a very reasonable career including a Best Actress nom for Leaving Las Vegas – was a good replacement fit. Truth is though, Shue has almost nothing to do here – Jen is unconscious through most of Part II and isn’t awakened until the very end of Part III. So again, it is no one’s fault, but it’s still the first sign that the old magic is no longer there. This is doubled by the absence of Glover in the vital role of father George McFly – this absence due to a contract squabble. George is mostly pushed into the background, shown in flashbacks to the original with Glover and then a few very brief shots at the end of the vaguely similar-looking Jeffrey Weissman wearing sunglasses and an alike hairdo trying to pass as Glover. Oddly, despite these obvious changes, in Parts II & III many of the relatives are played by the same actors – Fox plays not only his great grandfather and son but even his own daughter, Thomas Wilson plays his own son and also his great grandfather and Lea Thompson even plays a long-ago female descendent that by all rights Marty’s momshould have no relationship with – since the woman was married into her husband’s family. This explanation is sort of a round-about way of pointing out the biggest, probably fatal, problem with Back to the Future, Part II. It’s trying to be too clever by a half, but instead it becomes just murky. The storyline keeps doubling back upon itself – hopping back and forth between the present and the future and the past, so that at quite a few points you have scenes within the periphery of scenes we already saw in the first movie. Characters watching their own characters and pulling strings on the sides so you will often have a time-traveler in the same scenes as themselves. It’s supposed to be quirky, but mostly it’s just tiring. Back to the Future, Part III slows things down significantly – though the opening repeats Part II’s trick of opening up on the last few scenes of the last chapter. The problem is the last few scenes of Part II came greatly from Part I, so it gets an unfortunate effect ofbeing stuck in a mirror maze. However, following this beginning, Part III settles into a more measured pace, turning the film into a pastiche of old westerns and dialing down the technology to low. Doc Brown is mistakenly sent into the Old West in the time machine. Marty learns through a decades-old Western Union delivery that Doc is alive and well as a locksmith in the 1800s – but also that Doc will be killed by an ancestor of Biff’s if Marty doesn’t go back to save him. It is never explained what happened to Doc Brown’s version of the DeLorean that sent him to the past. Marty picks up the time-travelling car in the future down “the space time continuum” – but when he arrives in the past to get Doc, it seems there should be two broken-down time machines there, not just the one. However, Doc has pretty much settled into the role of Old West blacksmith, allowing Part III to do some gentle (and mostly way outdated) parody of old western movies. Doc Brown even finds a love interest, in the form of a new local schoolmarm named Clara Clayton, played by Mary Steenburgen. Steenburgen does what she can with a mostly thankless role. Interesting trivia factoid: The speech that the Doc uses to break the news that to Clara that he has arrived to her era in a time machine is almost word for word the same as one that Steenburgen heard over a decade earlier in one of her first major roles – in that instance from noted science fiction writer H.G. Wells (Malcolm McDowell) inthe greatly superior film Time After Time (1979). Part III has its moments, but honestly after the wild flights of fancy of the first (and even the second film, even though in the second they often go off the tracks), the languid pace and storyline feels sort of anachronistic and just a bit dull. This new Blu-Ray or DVD box set also comes with a slew of new features, interviews with the actors 25 years later, documentaries on the making of the film and the science behind the ideas. Personally, the one extra which most excited me – in fact it excited me more than Parts II and III, was that they give the complete Back to the Future: The Ride, a long-running amusement park version of the series which has just been closed down at Universal Studios Hollywood and Florida in the past few years. Of course it is not the same experience on your home TV as it was on a full screen inside a constantly moving DeLorean space pod – but it is still great fun to see it again. Copyright ©2010 PopEntertainment.com. All rights reserved. Posted: April 13, 2010. 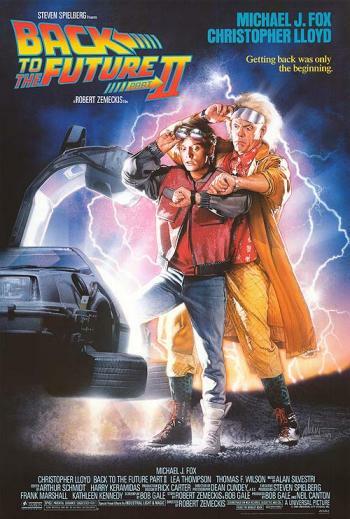 Tags: 25th ANNIVERSARY EDITION, Back to the Future, Back to the Future II, Back to the Future III, BACK TO THE FUTURE TRILOGY, Billy Zane, Bob Gale, Burton Gilliam, Casey Siemaszko, christopher lloyd, Claudia Wells, DeLorean, Elijah Wood, Elisabeth Shue, Flea, George DiCenzo, Huey Lewis, J.J. Cohen Marc McClure, James Tolkan, Jason Hervey, Jason Scott Lee, Jay S. Jacobs, Jeffrey Weissman, Joe Flaherty, lea thompson, michael j. fox, Richard Dysart, Robert Zemeckis, Thomas F. Wilson, Time travel, Wendie Jo Sperber, ZZ Top. Bookmark the permalink.